The Advantage 75' Expanding Garden Hose with Nozzle is a high performance dual chamber garden hose that automatically expands up to 3X its length while giving you a powerful high-flow water spray. Simply watch our hose expand and contract as your water is turned on and off. 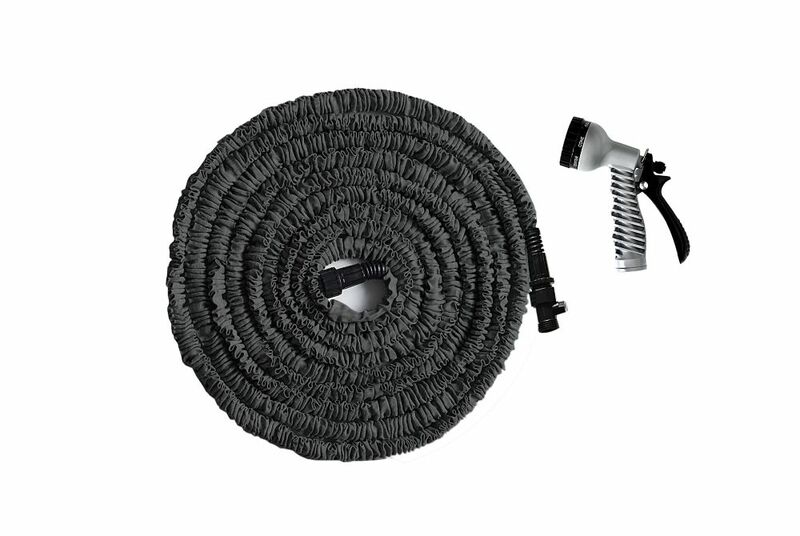 Our strong and ultra lightweight garden hose will not twist, tangle or kink and the accordion design allows for ease of use and compact storage. No more struggling with heavy traditional style garden hoses. The Advantage Expanding Garden Hose simplifies your work around the house and yard and is perfect for all your outdoor watering applications !!! The all-season flat hose retains flexibility in all weather conditions (-10*C to +76*C). Its polyurethane hose construction has round to flat hose memory and is antimicrobial and drinking water safe for all gardening, camping, marine and RV applications. Equipped with lead-free all metal fittings provides durability yet it is extremely lightweight and will not kink. Made in Canada. Advantage 75 ft. Expanding Garden Hose with Nozzle The Advantage 75' Expanding Garden Hose with Nozzle is a high performance dual chamber garden hose that automatically expands up to 3X its length while giving you a powerful high-flow water spray. Simply watch our hose expand and contract as your water is turned on and off. Our strong and ultra lightweight garden hose will not twist, tangle or kink and the accordion design allows for ease of use and compact storage. No more struggling with heavy traditional style garden hoses. The Advantage Expanding Garden Hose simplifies your work around the house and yard and is perfect for all your outdoor watering applications !!! Advantage 75 ft. Expanding Garden Hose with Nozzle is rated 2.7 out of 5 by 7. Rated 1 out of 5 by Steve Emmins from DON’T BUY THIS PRODUCT! PLEASE, PLEASE DO NOT PURCHASE THIS PRODUCT! On paper this collapsible hose seems like a dream product, once you start using it the dream becomes a nightmare. I’m getting on in years and not in perfect health, our previous hose was very heavy and barely flexible so the idea of a lightweight hose that collapsed after use seemed like a great solution. We purchased the 75’ version which was only available as an on-line order. A few days later U.P.S. delivered a 6” square box, I thought there was no way this small package contains our new hose perhaps it was just the hand sprayer that was included with our purchase but to my surprise the tiny carton contained both the 75’ hose and the nozzle. As hoses go this thing is very cool looking. We immediately unboxed it, took it outside and connected it to the facet - we just didn’t believe this short little hose was going to expand to 75’ but we were wrong... it did. We treated the hose pretty much as you would handle any hose, we dragged it on the ground over both concrete and grass - it took about a week and a half before the hose burst into 2 separate pieces. Figuring this was just a one off anomaly we returned to Home Depot where they exchanged it for a new one. This time we handled the hose extremely gently, my wife would help me when it was time to water by bridging the hose so it didn’t drag on the ground. This time the hose lasted almost 3 weeks before suffering the same fate as its predecessor. The nearest I can figure is that this hose is comprised of 2 layers, an expandable rubber bladder on the inside covered by a thin nylon sock-like cover outside - get the slightest wear mark on this nylon cover (which is unavoidable) and it’s days are numbered, Back to Home Depot who to their credit exchanged it once again with a smile. We just took the third instalment for a test drive - it doesn’t work at all, somehow there is a blockage up where the hose and the connecting hardware meet. Guess there’s another visit to Home Depot in our future. Hopefully 4 times will be the charm. This by no means was a cheap hose, I believe we paid close to $60 for it and it also wasn’t purchased from some mom & pop operation - this was Home Depot and I would have expected them to have vetted their products a little better. Again.... DON’T BUY THIS PRODUCT! Rated 5 out of 5 by Murphy from Happy Customer Stretch, Fold, Storage, Good Price, Fast Delivery. Rated 5 out of 5 by Gen52 from Fast, fast service and correct items.. I have used your order web services 3 times now and am happy in getting the correct item and within 2-3 days. Rated 5 out of 5 by Aces from Low storage profile hose...love it! I've only had this a month or so & so far love it. It's what I expected; easy to handle, great to stow, works well. However I've heard of bursting, so am cautious to turn water on low. That's all that needed anyways, to have this hose work at max. I feel it's important to release all water from the hose after Shutting off the water at source. It just makes sense maintenance wise. Rated 1 out of 5 by AKC1 from 2-time Fail This hose sprang a leak within the 30-day limit and Home Depot replaced it with a new one which also sprang a leak within three uses. Great concept, terrible product, should be pulled from the market. Rated 1 out of 5 by James from Second time failure I bought this product for the first time several weeks ago and within a week it developed bleak. "No problem" said the telephone rep "You are within 30 days (?) so we can replace it "did so and got a replacement which also split within two weeks. Trouble was I hadn't used it and the time has elapsed. How can it break after no more than 5 uses?